I always enjoy following the progress of other makers' projects, so I have started posting the same kind of progress reports I send to my customers on my blog. Here is a link to the post where I described the construction of this latest Sturmhaube. That's really nice, like all of your work! Whenever I get "done" with the viking kit I am pursuing now, I will work on a Landesknecht I think. This helmet is something to dream of. 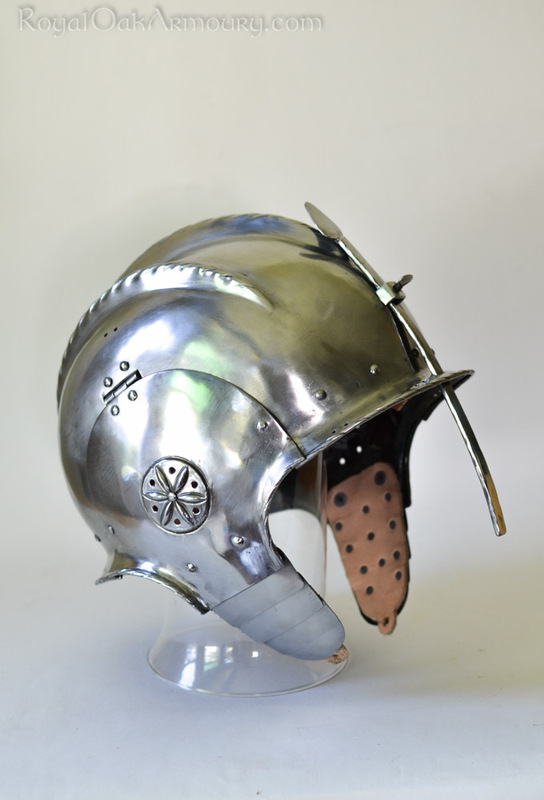 thats a very nice, simple, functional helm , i love it..
its decorated JUST enough to look nice but is in no way ostentatious, the inclusion of some slight cheek pieces and an adjustable nasal are also nice touches. Thanks, guys. The helmet's owner plans to have it covered in cloth, which will leave the roped edges, combs and ear-decorations exposed. I am anxious to see what the colour and texture contrast does for it. I will post a photo here when it is finished.